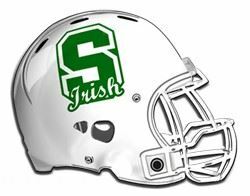 How many high school football teams are nicknamed Irish, Fightin’ Irish or Fighting Irish? On this St. Patrick’s Day I was wondering how many high school schools use Irish or a version of it for their nickname. To figure it out, I went to the website www.highschoolnicknames.homestead.com/. According to the website, there are 52 schools that use Irish, Fightin’ Irish or Fighting Irish, including Saint Patrick’s High School in North Platte, Nebraska. and Shamrock High School in Shamrock, Texas.